If the NFL believes the “Jerry Jones” will work, they should invest in some Hillary Clinton’s next presidential campaign. 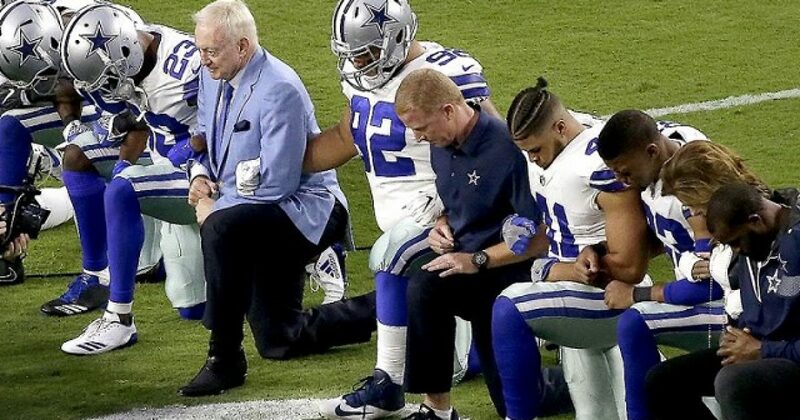 The “Jerry Jones” is when the players kneel beforehand, then lock arms during the national anthem. Do they really believe the public is that stupid? And you know it was stupid, because the New York Times called it “progressive”. The Dallas Cowboys’ market cap is said to hover around $5B, double that of other franchises. My bet is the Cowboys pulling that “Jerry Jones” went over like a North Korean rocket shortly after takeoff. Many fans I know said the Dallas Cowboys is no longer “America’s team”. Ouch. And now the NFL has tried the “Jerry Jones” on multiple occasions, in hopes of appeasing fans. Most recently they pulled this stunt on Thursday Night Football. In what should have been a BOON for the NFL, they got another in a series of disappointments on Thursday Night Football. If all press is good press, then the stadium should have been full, and the ratings through the roof. But Thursday night proved to be anything but a rebound for the Not For Long, Roger Goodell-run politically correct sport formerly known as American football. There were weather issues, national anthem protest concerns and a helmet-to-helmet hit from the Chicago Bears’ Danny Trevathan that put Green Bay Packers receiver Davante Adams in the hospital last night on the season kickoff of CBS’ Thursday Night Football. Not even one of the NFL’s biggest rivalries could save the day. The NFL will learn soon that it must do a full mea culpa on kneeling during the national anthem or the writing is on the wall for the league. I find it ironic that a sport that employs 70 percent blacks will be ruined by the very men who receive its rewards. Thus, black multi-millionaires whom for the most part can do little else career-wise, will relegate themselves to mediocrity in life over a lie. This notion alone explains just how ignorant black Leftists can be. NFL players allow one petulant half-black man to ruin things for everybody. Sound familiar? Look at what Obama did for Democrats. What about the 1,080 losses over the past 8 years? Of course Barack Obama is the real culprit on that count. However, Nancy Pelosi and Harry Reid loved their black president, no matter what. Thus they followed him over the cliff. Why didn’t somebody sound the warning bell at say, 200? But now, suddenly the loss of four Republican seats is the wake-up call the Democrats needed? And they wonder why they lost in November? This scenario reminds me of the man with the 150 pound scrotum. Exactly when did this guy decide he was tired of dragging his crotch around like a teenager hanging on his leg? Most people would have gone to see the doctor after only a few ounces, worse case a pound. The Democrats watched election after election as they lost state legislators and Congressional seats. Then they lost Senate seats and governorships. Donald Trump came along and Democrats dismissed the man. In fact, most Democrats thought beating Trump would be so easy a caveman could do it. Perhaps a caveman could have beaten Trump, but Hillary Clinton couldn’t. Why shouldn’t the NFL put its faith in a half-black nitwit named Kaepernick. Things certainly worked out well for the Democrats! The NFL’s strategy has backfired, because people are not as stupid as the NFL and other Democrats believe. In fact, we are pretty smart, and know when we’re being played. Sadly, nobody talks about the overwhelming rejection of Black Lives Matter by the plurality of black players. Consider that of the 1700 players in the league, originally 9 took a knee. After the president’s comments, estimates were around 100 took a knee; less than 6 percent. These young black men go unheralded, and it’s time we begin to recognize them for standing up for America.